A bootable backup is a redundant copy of the system drive inside your computer. It has the same operating system and application programs as your system drive. The user configuration and all data files are the same, too. If something were to happen to your primary system drive, you could easily reboot your computer from your backup drive and be up and running as if nothing ever happened. This guide explains how to clone your hard drive and make a bootable backup onto a locally attached external hard drive. It will take you through the entire process from hard drive selection to configuring ChronoSync to perform the bootable backup. It will then explain some variations to the standard setup that you may want to consider. Lastly, it will explain how to use your bootable backup should a recovery become necessary. Important Note: There is no one-size-fits-all backup strategy. This guide presents the concept of a bootable backup and how it can be used to create a redundant, bootable system. It should not be your only form of backup. It should be combined with other backup strategies to create multiple levels of redundancy. You cannot be too cautious when it comes to backup. One level of redundancy is not enough — the moment you lose your primary data, your backup IS your primary and you no longer have redundancy! The task of creating a bootable backup, often referred to as cloning your hard drive, is not unique to ChronoSync. There are numerous apps for macOS that can perform the job. So why should you chose ChronoSync over all the others? Besides being extremely fast and efficient, ChronoSync has the advantage of being scalable. 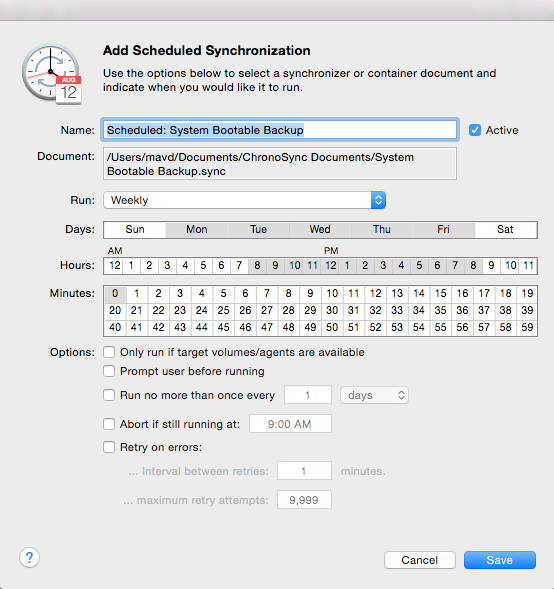 As your backup needs grow and extend beyond simple bootable backups, ChronoSync can step up and meet those needs. Because you will never pay an upgrade fee, it is a very safe investment that is uniquely capable of fulfilling your backup needs no matter how they may grow over time. To create a bootable backup you will need an extra hard drive where the backup data will be placed. For most Macs, this requires purchasing an external hard drive. There are two primary considerations when making the choice: storage capacity and hardware interface. Other factors that will influence the decision are whether you want a consumer or professional grade device and, of course, price. In general, you can expect to pay from $50 to $200 for a consumer grade drive or $150 - $500 for a professional grade drive that is capable of performing as a bootable backup for any modern Mac. All Macs made in the past decade support USB, thus any USB drive would work. If you have a USB-3 interface, you should take advantage of it by purchasing a USB-3 drive. This is less of an issue these days because purchasing a USB drive that does not have a USB-3 interface is very difficult. It should only be a concern if purchasing older hardware. USB-3 provides very good performance at a very affordable price. USB-2 (and older) drives don't offer the same level of performance but may be your only option if you have a Mac more than a few years old. Thunderbolt is a modern, high performance interface. Thunderbolt hard drives are considered the current top of the line. They will offer much higher performance than USB-3. They are more expensive and typically considered "professional grade." Most consumers generally don't need Thunderbolt performance — they will be perfectly happy with a USB-3 drive. FireWire is less relevant these days. If you have older hardware with a FireWire interface, you will most likely have USB-2 as your only alternative. If this is the case, FireWire will offer much better performance but at a higher price. As with Thunderbolt, FireWire drives are generally more "professional grade." If you have both a USB-2 and FireWire interface available to you, we definitely recommend choosing a FireWire drive over USB-2, provided you don't find the extra cost prohibitive. As for storage capacity, the minimum size should be twice that of your internal system drive. For example, if your system drive is 500 GB, the minimum size for your external should be 1 TB. To determine the size of your system drive, select "About this Mac" from the Apple menu at the top left of your screen. A system overview window will appear. Choose the "Storage" tab and all connected hard drives will appear. Your system drive should be the first one listed. In the above screenshot, there is only one hard drive on the system. It is listed as a "240 GB Solid State SATA Drive." In this case, a 500 GB hard drive should be the minimum considered for a bootable backup. As for maximum size — there is no maximum size! Get the largest drive you are willing to purchase. The extra space will not be wasted! Once your hard drive has been purchased, connect it to your computer using the required interface and power it up. The drive will almost certainly need reformatting. Even if it is already formatted for macOS, it is probably not partitioned correctly. Partitioning refers to the process of splitting up the drive into usable volumes. Note: If the drive you purchased was "Made for Mac", it may come with software on it. You should consider copying the software over to your system drive. Using Finder, just create a folder in your "Documents" folder and drag the software on your external hard drive over to it. Also, although rare, some hard drive vendors may have special drivers that need to be installed. If such is the case, run the installers first before you proceed to reformatting the drive. In this case, make sure you copy the installers over to your system drive so you have the installers if you ever need them again in the future. To format your drive, you will need to launch the Disk Utility application. It is on your system drive in the "Utilities" folder that is within the "Applications" folder. If you use Launchpad, it should be in the "Other" group. Once you launch Disk Utility, all the attached hard drives will be listed in the sidebar on the left. Each drive will be listed as a device and any volumes on the drive will be listed as sub-entries for that device. A volume equates to a partition on the drive and represents a portion of the drive that has been allocated to exist as a separate, logical disk. A single hard drive can be partitioned into many volumes, each acting as a separate, independent disk. For a standard clone of your hard drive you will need at least one partition. You also have the option to create additional partitions depending on your needs. 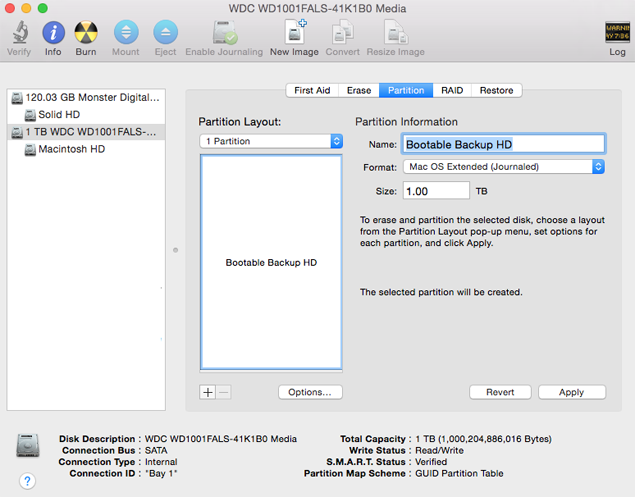 For this example we will choose "1 partition" and name it "Bootable Backup HD". At the bottom of the window, make sure "Partition Map Scheme" is "GUID Partition Table". This should be the default but if it isn't listed this way, click the "Options…" button and choose "GUID Partition Table." You can now click the "Apply" button and wait for the partitioning to complete. It should take just a few moments. For more detailed instructions about using Disk Utility to initialize your hard drive, take a look at our 'Formatting and Partitioning Hard Drives' guide. Note: After partitioning is complete, the operating system is going to step in and ask if you want to use this volume for Time Machine backups. There actually are legitimate reasons why you might want to do this but for now, just say "No." With the destination hard drive attached and prepped, now it's time to create the bootable backup in ChronoSync. Begin by launching ChronoSync and, when the Document Organizer window appears, click "Create a new synchronizer document." A new synchronizer document window will appear and you will be asked to supply a name. Supply something meaningful that describes the task such as "System Bootable Backup." Note: you will be asked to supply your administrator credentials since full administrative access is required to create a bootable backup. 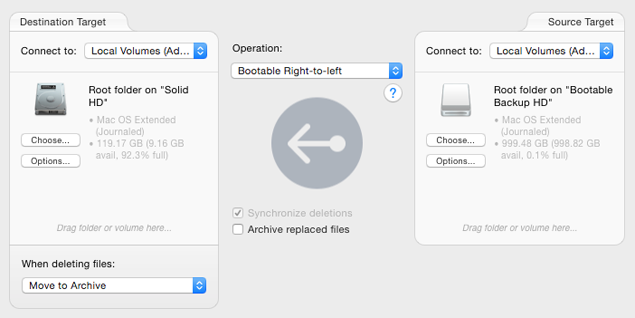 A "Bootable Left-to-right" operation signifies that we will take the source target, on the left side of the operation, and make a bootable backup of it on the destination target, to the right side of the operation. Logically, the next step is to specify what the source and destination targets are. By default, after choosing "Bootable Left-to-right", the source target is automatically changed to be your system boot drive. Most of the time, this is what you want, so you won't need to change it. If you are making a bootable backup of a different hard drive, you can select it by clicking "Choose…" in the "Source Target" pane. The basic synchronizer document configuration is complete and ready to run! Everything is set to go at this point and you certainly may proceed to run your initial bootable backup. However, you've probably noticed that there is a lot more to the synchronizer document than you have configured. It's true — there are a LOT of options that you can specify! ChronoSync understands that there is no one-size-fits-all configuration and thus provides the options to fit your needs. For a standard bootable backup — which is what we are doing here — there are only a few extra options that you may want to consider, so we'll cover them here. This setting is staring you in the face on the Setup Panel. ChronoSync has the ability to create an archive where it places old files that are no longer part of the backup set but that you may want to keep around. 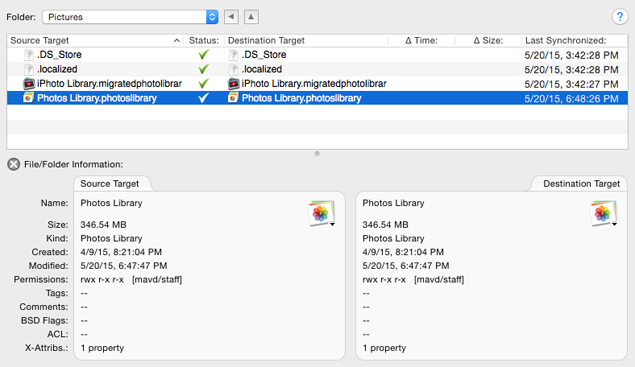 By default, any file that is deleted on the destination target is moved to the archive. This is a safety setting so that if you make a mistake when configuring your synchronizer document, any file that gets deleted will still exist in the archive — and can be recovered! The "Archive replaced files" feature behaves similarly. Any file that is changed on your source target will get copied over to the destination target. If you enable "Archive replaced files", then the file on the destination that would get overwritten by such an operation will be moved to the archive so you still have an old copy. This setting is not ON by default since it is not necessary for safety — you still have a copy on your destination no matter what! Both the archive deletions and archive replaced files behavior may not be what you want. On the one hand, it seems prudent to enable both behaviors just to be extra safe. On the other hand, there are a LOT of operating system files that will get copied as part of a bootable backup operation — maybe even more than a million! Many of these files will frequently change and thus will consume a lot of disk space in the archive. It will also require a lot of knowledge and expertise on the part of the user to understand the purpose of these individual files and how they should be restored. Because of this, there is generally little value archiving operating system files. On the flip side, all your personal documents are being copied as part of the bootable backup. For these files, there is extreme value in having them archived, both for deletions AND replacements. Because of this, we recommend taking a hybrid approach to bootable backups. We'll describe what that means later in this guide. In short, if you take the hybrid approach discussed later, we recommend keeping "Archived replaced files" OFF and changing "When deleting files" to "Immediately." If you won't be taking the hybrid approach, keep the default settings as displayed above. If you don't take the hybrid approach and your backup volume is significantly larger than your boot volume (at least twice as big), go ahead and enable "Archive replaced files" — it will provide a good safety net! This group of settings modify how ChronoSync deals with errors and warnings that may occur during a sync or backup operation. The default settings dictate that any errors and warnings that occur during the backup will be presented to the user as they occur. The operation will pause until the user responds to them. This is normally just what you want except for the fact that a full clone of your hard drive can take quite a while to complete the very first time it is run. It is not uncommon to start the operation and then leave your computer for a while. You don't want an error or warning to appear a few minutes into the operation and sit there waiting for user input that might not come until a couple hours later! If this is the case, you should change the "Errors:" and "Roll-backs:" settings to "Skip." Any errors or warnings that occur will be written to the synchronizer document's log file and the completion summary presented to you by ChronoSync will let you know that errors occurred. You can investigate them after the fact. Not that you should expect errors or warnings but sometimes they happen for benign reasons. Changing these options will help avoid frustration! This group determines how files and folders should be scanned and handled. If you are performing a standard bootable backup whereby the destination hard drive will not be moved and connected to different computers, you will want to enable the SmartScan feature. It really helps performance when the number of files being analyzed is very large. To do this, change the popup menu from "Basic" to "Custom", then enable the "SmartScan (when available)" option. Note that SmartScan will not kick in until after you have completed your first full backup. The true benefit of SmartScan will not be realized until the third full backup. More information on the SmartScan technology can be found here. At this point, all your synchronizer document settings have been specified and the desired options chosen. You are now ready to run the synchronizer document! To do this, click the "Synchronize" button in the toolbar, or switch back to the Setup Panel and click the big circular button beneath the "Operation" popup menu. The first full clone of your hard drive will take the longest time. Every single file on the system drive must be scanned and copied. The exact amount of time it will take depends on many factors: how many files are on the source volume? how large are those files? how fast are your hard drives? what kind of drive interface are you using? how fast is your computer? A late model Mac Mini with about 200 GB worth of data on its system disk will take about 1.3 hours to backup to a Thunderbolt hard drive. 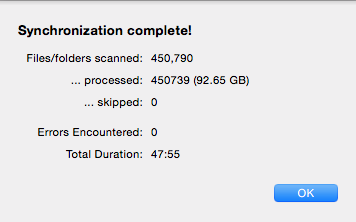 The same amount of data on a circa 2010 MacBook Pro backing up to a USB 2 hard drive may take about 3.5 hours. You can achieve faster times than these or slower times depending on all the factors. The good news is that subsequent runs will be much faster. These same two systems will run their backups in 4-8 minutes or 10-15 minutes, respectively, depending on how much data changed in between backup runs. Again, "your mileage may vary!" After the initial clone of your hard drive is complete, it's time to test your bootable backup operation. This is important because, despite our best efforts, not all devices are the same when it comes to supporting boot-ability. This is rare, but, sometimes it just doesn't work! Note: This section is presented in the context of testing your initial bootable backup. Before you test your initial bootable backup, you should read the POTENTIAL PITFALLS section so you are aware of some problems that may occur when regularly booting into and using your bootable backup. Specifically, pay attention to the AUTOMATIC SYNCHRONIZING DATA discussion, as logging into your user account on the bootable backup may trigger unexpected data interchanges with online services such as iCloud and others. Creating a test user account for validating your bootable backups is a highly recommended practice! 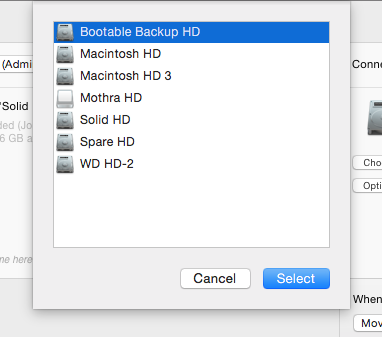 If all is well, "Bootable Backup HD" should appear in this list. You can select this volume by double-clicking it with your mouse or using the arrow keys to select it and press RETURN. Your system should begin booting from this device. Booting from your newly created bootable backup will seem slower than usual the first time you do so. This is because there is a bunch of information on the drive that is normally cached. These caches have to be reconstructed for the new boot volume. Even after this information is created, subsequent boots from this backup drive may seem slower than your built-in system drive. This is because your external hard drive interface is typically much slower than your built-in system drive's. This is okay — it's a backup, after all. You won't be booting from it regularly! Once the boot completes, your Mac should come up just like it normally does. If you are prompted for a password at login, just use the same one you normally use. For all intents and purposes, your bootable backup drive should function just like your primary system drive. You can peruse the file system and make sure everything is still there. You should avoid doing too much, however. You may end up inadvertently modifying configuration data that may be incompatible with data files that are copied on future hard drive cloning operations. You may also get "too comfortable" and forget that you are using the bootable backup! After you are convinced the bootable backup is good, go ahead and do a restart again. You shouldn't have to hold the OPTION key down this time — your system should revert to booting from the primary system drive. To run the backup again, just double click the "System Bootable Backup" item. You will need to authenticate as an administrator, after which you can run the backup just like you did previously. Subsequent runs will be much faster, depending on the scope of changes that occur in between runs. Alternatively, you may decide you want to schedule the backup to run automatically at a pre-determined interval. You can do this from the Document Organizer window, too. Just select the item and click the "Schedule…" button. A dialog window appears allowing you to specify exactly when you want the hard drive cloning operation to run. You can also schedule the same bootable backup operation to run at different time intervals by scheduling it multiple times. Just follow the above steps again! Run it before installing any significant new software and/or applying operating system updates. Run it again only after you've determined that said installs/updates are working properly and that your system is still stable. Following these rules presents a serious dilemma — sure, you don't want to run the bootable backup too frequently for fear of contaminating your backup system with a bad install BUT your active, personal data is also stored on your system disk. You DO want that information backed up frequently! Luckily, ChronoSync can accommodate these two, opposing viewpoints by taking a hybrid approach to backing up your system drive. As mentioned above, a bootable backup presents a quandary because you don't want to run it too frequently or you run the risk of capturing system instabilities. Yet you need to run it frequently to keep your personal data backed up and current. ChronoSync can address this by allowing a hybrid bootable backup scheme to be implemented. A hybrid backup simply means creating two synchronizer documents. One will take care of backing up all your system files while the other will backup your personal documents. The first can be run infrequently or whenever you deem it necessary. The second can be run quite frequently. Both will backup to the same bootable backup drive so if/when you need to recover from it, your system and personal data can be restored together. To create a hybrid backup system, launch ChronoSync. When the Document Organizer window is open, select the bootable backup document you just created. Right-click the mouse button (or hold the OPTION key down while doing a normal click) and select "Duplicate…" from the popup menu. Give the duplicated synchronizer document a meaningful name. In this case, we've specified "Hybrid Bootable Backup - Users" as the name. After clicking "OK", you may be asked to reset the document archive. If so, answer "Reset." Your duplicated synchronizer document will now appear in the Document Organizer. Double-click to edit it. Specify your administrator credentials if asked. You are now editing a perfect carbon copy of the original, bootable backup synchronizer document. Now it's time to modify it so that only a subset of your system drive will get backed up when running this synchronizer document. When the document window opens, make sure the Setup Panel is visible by clicking "Setup" in the sidebar. Specifically, make sure "Archive replaced files" is ON and that "When deleting files" is set to "Move to Archive." Now switch over to the Analyze Panel by clicking "Analyze" in the sidebar. Now choose "Exclude" from the "Actions" menu. An "X" should appear in the "Status" column for all entries except the "Users" folder. Save the synchronizer document by typing COMMAND-S (or choosing "Save" from the "File" menu). Your hybrid bootable backup synchronizer document has just been created! This synchronizer document will backup the entire contents of your Users Folder to your bootable backup hard drive. This will include any and all user accounts on your computer, all user's personal documents and personal configuration settings. This synchronizer document is the one that should be run frequently to ensure that your personal data is regularly backed up. As with the full system bootable backup, you may run it manually or you can schedule it. We suggest you schedule it and schedule it often. It should run much faster than the full system bootable backup does and, with the SmartScan option enabled, it may only take a few minutes (or less) to complete. While this synchronizer document should be the one you run frequently, don't forget about the main system bootable document we created first. We recommend you run it manually but follow the golden rules presented in the WHEN TO RUN THE BOOTABLE BACKUP section. Note: You may want to perform a similar modification to your System Bootable Backup document where you apply the opposite set of exclusion i.e. you select only the "Users" folder and exclude it. This prevents the two backups from overlapping each other. There is no technical problem with overlapping backups but you want to make the second backup document solely responsible for archiving your user data. There's no questioning that now that you have a bootable backup strategy in place you are in a better position than you were before. However, it would be disingenuous to imply that it's smooth sailing from here on and that everything is going to work out perfectly. There are potential pitfalls that you need to be aware of and prepared to deal with. Otherwise you may be in for a rude surprise — and suffer through a lot of unnecessary anxiety. This section presents some common problem areas that you must be aware of and prepared to deal with. You should have already tested the initial clone of your hard drive — that's good. However, you should regularly test your bootable backup to make sure it still works properly. This is especially true after you have applied a series of operating system updates. Just because they work fine when booted from your primary system drive doesn't necessarily mean they'll work fine when booted from your backup. Admittedly, this type of problem is rare — once you have a working bootable backup it tends to stay working. However, it's better to find out that something has gone wrong now than when you are forced into recovery mode after losing your primary drive! We recommend testing your bootable backup at least four times a year. Schedule it when the seasons change and you'll have a regular reminder of when you need to perform this task! Most of your software applications, including ChronoSync, will work perfectly when run from your bootable backup. However, some programs that feature strong anti-piracy measures may not. These programs have protections in place that detect if they have been copied. They deactivate themselves thinking that you have copied the program to another computer illegally. You haven't done anything wrong, but by copying them as part of a bootable backup, you have triggered the mechanisms they employ to protect themselves. Luckily, this problem typically manifests itself by having the program ask you to re-register the product. As long as you still have the original license key or serial number, you can re-register and use them just fine after booting from your backup. The key is, well, the key! You must make sure you still have those license keys available. Whether you add them to a text file that is part of your backup or you store them externally in a very safe place is up to you — just make sure you have access to them. You should test all your application programs when you perform your initial test-boot to verify your bootable backup. This will let you know which ones will require registration and allow you to track down your license keys now, when you are calm and collected (as opposed to panicking because you just lost your primary hard drive). If you have installed software on your primary system that automatically performs things in the background, those same operations are likely to occur when you boot from your bootable backup. A perfect example of this is ChronoSync itself! You may have scheduled a backup task to run frequently. When you boot from the bootable backup, the same task may kick in and start backing up data from your bootable backup, not your primary system drive. If your bootable backup is not current, you could be over-writing current data with older data. This problem is not unique to ChronoSync, either. Cloud-based backup and file synchronization services are equally susceptible. Non-backup programs such as messaging and email apps can also wreak havoc, retrieving your messages onto your backup system making them unavailable (or at the very least, marked as "read") when you reboot back into your primary system drive. This is why ChronoSync v4.6.3 introduced the feature where the background scheduler disables itself when it detects it is running from a different system. The following notification will be presented. If you want scheduled synchronizations to continue running, simply choose 'Resume Scheduler' from the Actions menu. To circumvent many of these problems, we recommend you create a "Backup Test" user account on your primary system drive. This account should never be used under normal circumstance. No software will be installed and configured for it. Instead, the only time you will use it is when you boot from your bootable backup to test it out. Only then will you login as the "Backup Test" user. Since no software was configured for that account, nothing should kick in automatically, yet you will still be able to test the integrity of your bootable backup. Bootable backups are often presented as these wonderful forms of redundancy that will get you up and running in minutes should something go wrong. Unfortunately, this is not exactly true. A bootable backup should not be your only backup. It needs to be augmented by some other form of backup. If your primary system fails and you are forced to boot from your bootable backup, you no longer have a bootable backup to fall back on should something go wrong. You need at least one more layer of backup to keep your data safe — at least until you can reconstruct your primary system drive and regain boot redundancy. Luckily, Chronosync can help with that, too, by creating additional backups that target other external drives, file server, NAS devices and more! Unfortunately, at some point during the course of using your computer, you WILL lose data — that is a fact of life. Having an effective backup strategy in place mitigates the risks associated with data loss — and lessens the anxiety when such data loss occurs. Amazingly, however, most guides and articles that cover backup strategies fail to discuss how to recover data should the inevitable happen. This guide will not follow that bad practice! The bootable backup you created as part of this guide is your first line of defense against data loss. How you recover from the bootable backup depends entirely on what data you are restoring and why. "Minor data loss" refers to the amount of lost data that needs to be recovered, not the importance of that data — it may, in fact, be critically important! This usually involves a small subset of the data on your system drive. The most common cause for this is a user induced action, i.e. the user inadvertently deleted or overwrote the data. 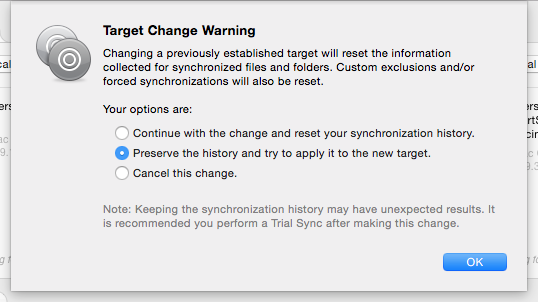 ChronoSync features a built-in restore tool that is a breeze to use. This is in contrast with many backup tools from other vendors that require you to perform a backup-in-reverse to recover your data. While that is a valid approach (and we're even going to recommend it later in this guide), it's really not the best or safest approach since the potential for making a mistake is high — and that can cause more problems than it aims to solve. 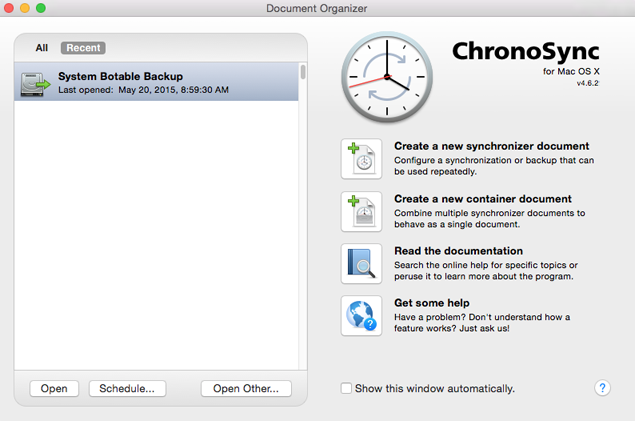 To begin recovering lost files, launch ChronoSync and open your synchronizer document. We're going to assume you've adopted the hybrid approach and will open the "Hybrid Bootable Backup - Users" document. When the document window is open, switch to the Analyze Panel and navigate down to the folder containing the lost files. You can drill down a folder by double-clicking on it or expanding the disclosure triangle that appears to the left of the folder. We've now located the library in the Pictures folder and you can see our local copy on the left has shrunk in size relative to the backup copy on the right. Luckily we have not run this backup yet or else the backup copy would get replaced by the local copy! To restore, we simply select the library file and choose "Restore -> From right…" in the "Actions" menu, or just right-click (OPTION-click) the selected entry. 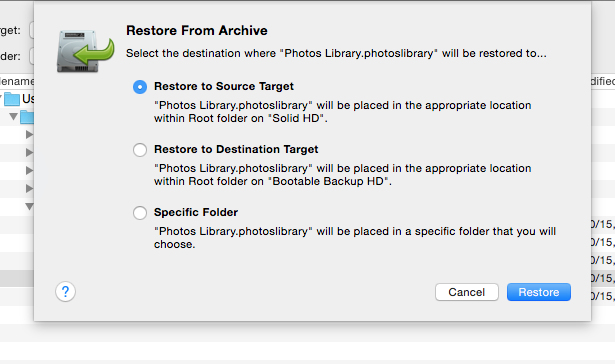 Invoking "Restore from Right…" brings up the Restore Options sheet window. We've selected the "Restore only items synchronized by this document" and "Replace existing items" options. We did not enable "only if replacing with a newer/older version" since we know we want to replace the library no matter what. 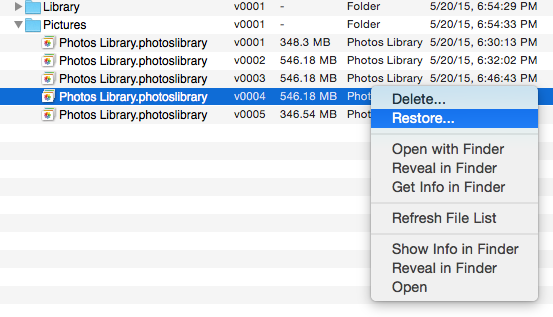 Clicking the "Restore" button performs the restore operation and our Photos library is now back the way we want it! 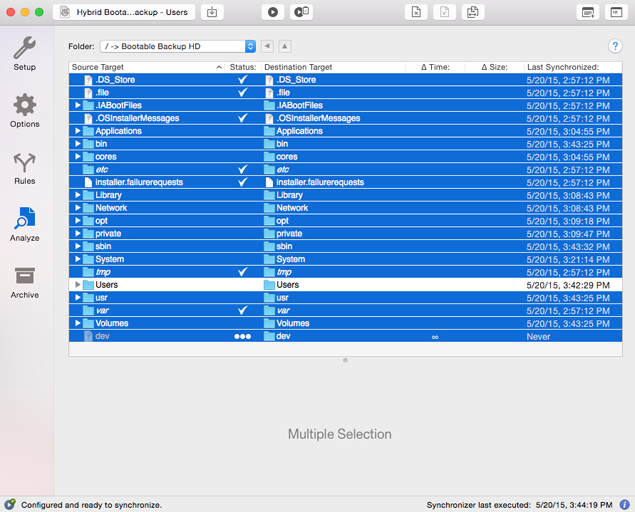 Note: you can select entire folders containing many sub-folders for the Restore operation — it is not limited to a single file. This simple Restore example is all well and good but what if we HAD run the backup after making our mass photo deletion and the modified library DID make its way over to the backup drive? 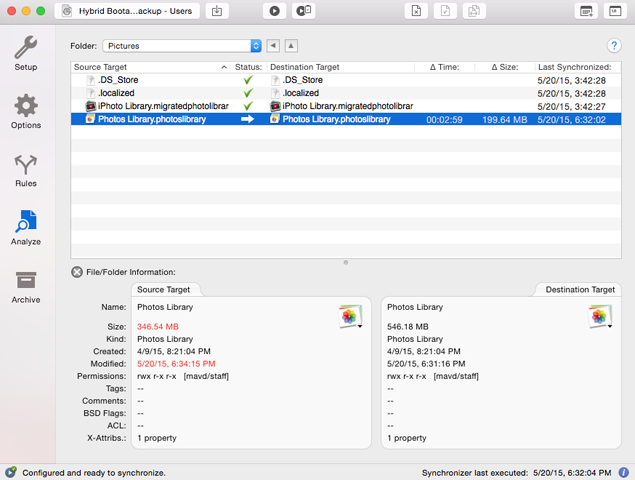 Our hearts sink as we look at the Photos library in the Analyze Panel and they are exactly the same — there’s nothing to restore from! Never fear — archiving is here! Because we enabled "Archive replaced files" when configuring this synchronizer, an archived copy of the library should exist. Switch to the Archive Panel by clicking "Archive" on the synchronizer document's sidebar. Here we've located five versions of the library. The version numbers increase sequentially, so "v0005" is the latest one added to the archive. The "Archived" timestamp confirms this. The "Modified" timestamp shows when the contents of the library were last changed by the user, before it was ever added to the archive. Given all this info (and the telltale sign of the size going down by 200 MB), we've determined that the last version that contains the photos we deleted is "v0004". The first selected option, "Restore to Source Target", is what we want. This will replace our original Photos library on the system drive. If we were unsure that this really was the file we wanted to restore, we'd choose "Specific Folder." That would restore it by itself into a separate folder, allowing us to examine it safely before replacing the original. Note also: By default, ChronoSync will only maintain five copies of the same file in an archive. You can change this setting in the "Archive Handling" group within the Options Panel of your synchronizer document. If you've lost your primary system drive due to hardware failure or disk corruption, you're going to have to perform a total system restore. While there are many steps that need to be taken to reach this conclusion, this guide is going to assume you've correctly made this determination. Troubleshooting system glitches is an art in and of itself — and way beyond the scope of this guide! To begin with a full system recovery, you will need to boot from your bootable backup drive. Restart your Mac (or more likely, perform a power-up) holding the OPTION key down as described in the TEST THE BOOTABLE BACKUP section. When the Startup Manager appears, choose your bootable backup drive and begin the boot process. At this point you're going to have to prepare the drive that you will be restoring to. We are going to assume that you have either replaced the original system drive with a new hard drive or you have determined the drive hardware is okay and simply needs a reformat. In both cases, you are going to begin by erasing the drive using Disk Utility. You will need to follow all the same steps presented in the PREPPING THE DRIVE section, above, except when you name the partition, specify the same name as your old system drive (which is probably "Macintosh HD"). Be extremely careful to choose the correct drive to erase! Once you have prepped the drive you will be restoring to, you should launch ChronoSync. Since all the synchronizer documents you created on your previous system drive were part of your bootable backup, they should all appear in the Document Organizer. Find the "System Bootable Backup" document that you were using before, select it and then invoke the "Duplicate" function as described in HYBRID BOOTABLE BACKUP. 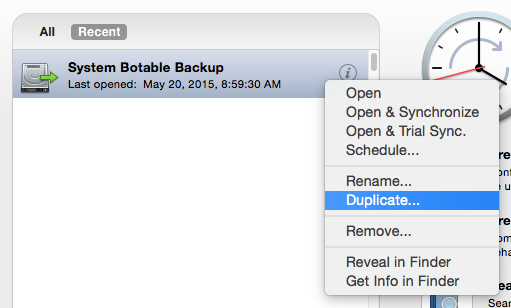 Give the duplicate document a name such as "Restore System Bootable." Now select the "Restore System Bootable" document and open it. Your document should look like this (switch to the Setup Panel, if necessary). As you see, the drive that was formerly the source of the bootable backup operation cannot be located. All reference to the original hard drive has been lost. That's okay because we are going to re-locate the target. 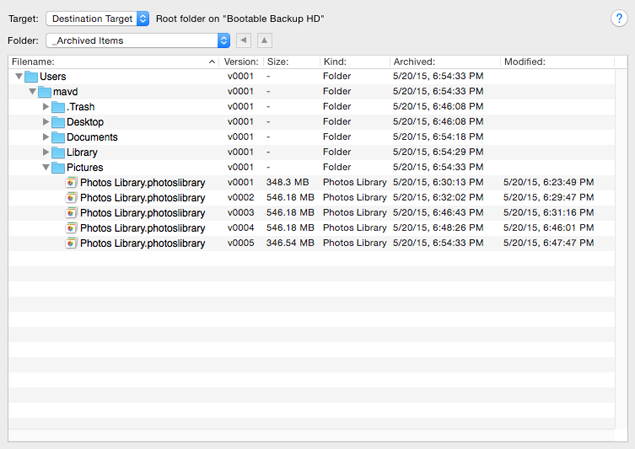 Click "Choose…" on the left side and select the drive that you just prepped for restore. The following warning sheet will appear. This is quite safe to ignore - just click "OK". Notice how the right side is now the source and left side is the destination. This effectively makes a bootable backup of your bootable backup, restoring your primary system drive to its former glory. Go ahead and click the large "Synchronize" button, then sit back and wait for you system to be restored! Sometimes, the new backup volume isn't recognized when holding down the Option key at startup. 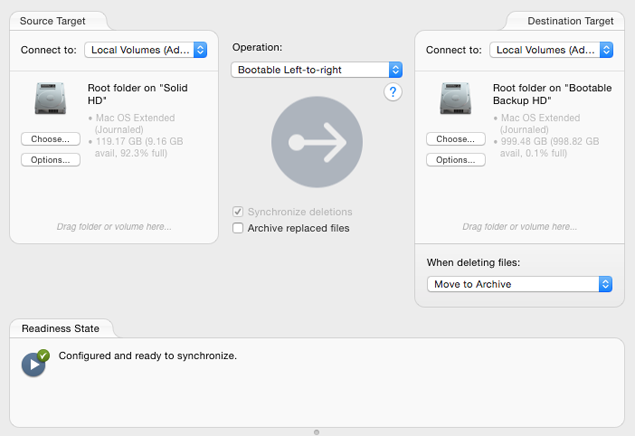 If you find the newly minted backup missing from the list of startup volumes, try this alternate startup option: Startup your Mac normally and launch System Preferences->Startup Disk. Is your backup listed? Try choosing it and restarting the Mac. If that works, then try the Option-key method to see if the drive is recognized. If you can choose the backup volume, but it just doesn't startup the Mac, double-check your drive's partitioning and format. 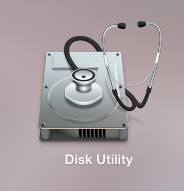 Launch Disk Utility (Applications->Utilities->Disk Utility) and select your backup drive from the list on the left. Choose the device rather than one of the partitions created on the drive. Review the drive details for 'Partition Map:' and confirm that it reports 'GUID Partition Map'. If it says something else for 'Partition Map' then revisit PREPPING THE DRIVE or take a look at our 'Formatting and Partitioning Hard Drives' guide. "Check a disk for problems"
"Ways to start up your Mac"